I love HBL Hair Care they have some really great products a couple that I was able to try were the their Volumizing Line which comes with the volumizing shampoo and conditioner and also the Hair Masque all of these products work great on my hair. hbl's Volumizing Shampoo gently cleanses, smooths and adds volume to all hair types. Jojoba Seed Oil moisturizes strands and improves elasticity while Keratin Amino Acids naturally repair and strengthen. Silk protein seals and smoothes the cuticle. Wet hair, apply generously, lather and rinse. For best results use with hbl Volumizing Conditioner followed by hbl Leave-In Conditioner. 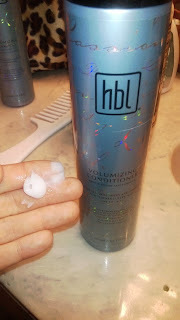 hbl's Volumizing Conditioner smooths, volumizes and protects hair for fuller, thicker and more manageable results. This gentle, color-safe formula includes Vitamins A, B and E act as natural anti-oxidants as Panthenol thickens and moisturizes the hair shaft and silk protein seals and smooths the cuticle. For all hair types. Follow with hbl Leave-In Conditioner for best results. pH 3.5-4.5) Intensely smoothes, conditions and protects even the most challenging hair without weighing it down or leaving a greasy feeling. 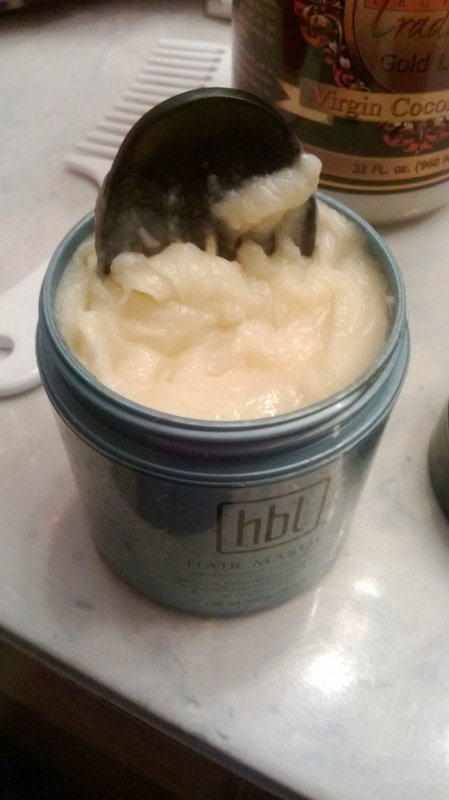 Well suited for all hair types, Hair Masque can be used with or without heat, depending on the level of conditioning desired. Keratin Amino Acids naturally repair and strengthen hair and add elasticity while cetyl esters work to smooth, repair and seal damaged cuticle. 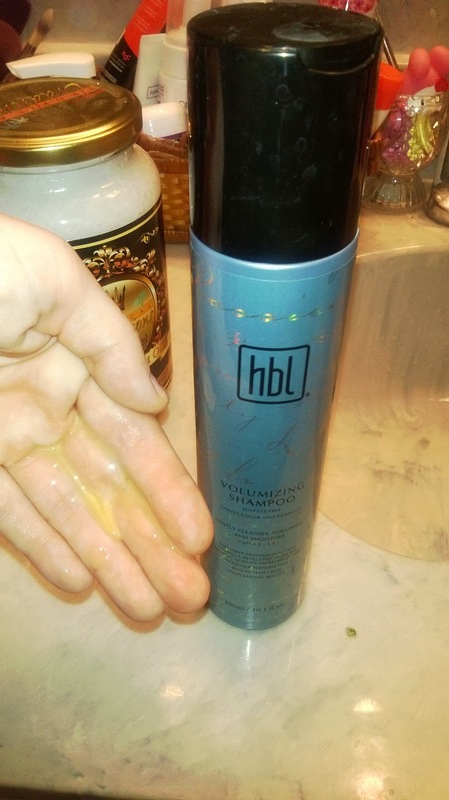 I have found a great product in this shampoo line and and really excited about it!! Would you like to try this line too??? Your in Luck!! One of my lucky readers will win this set!! Open to the USA only!!! I use Abba Moisture Shampoo and Desert Essence Coconut Conditioner! I use Tigi products. I need something to help with my frizzy hair. First of all... The products I'm currently using are samples from Peter Thomas Roth and fekaii. I am wicked picky about shampoo and conditioner so I change all the time! Right now I am using volumizing herbal esscense's shampoo and conditioner. Honestly I use whatever I can find a good deal on, usually herbal essences or pantene pro v! I'm always trying different products. Lately I've been using Suave Clarifying Shampoo, Argan Oil shampoo and conditioner, Paul Mitchell ginger cream rinse, and some awesome Rosemary Mint Conditioner. I would love to try these products out! Just tried to leave a comment, but I'm not sure if it actually published... sorry if this is a repeat! Lately I've been using Suave Clarifying shampoo, Organix Argan Oil shampoo and conditioner, Paul Mitchell ginger cream rinse, and some really great rosemary mint conditioner. Would love to try HBL! Right now I'm using Pantene, but I do change it up every now and then. Thank you. I use Garnier Fructis for the moment. It's not working too hot, so I need new products to try! I currently use Purology products for my hair care routine. I currently just use a shampoo and conditioner. I use Pantene shampoo and Suave Professionals conditioner. I like Pantene and I really like Garnier Fructis' "Pure Clean Fortifying Shampoo"
I use anything I can get my hands on. I trade brands all the time. I general use Treseme and some Pantene expert ptroducts! I use yes to carrots and tresemme. Tresseme is usually what I use! There is a British company called Templespa. I LOVE their shampoo - good hair day. (among their other products.) I switch between this and Lush Big to keep my thin hair volumized. I switch it up a lot, but lately I've been using Dessert Essence shampoo and conditioner. Oh that should be Desert Essence, lol. I have not yet used any chemical or such kind of product on my hair. Is this product does not damage my hair. At present i am using hair styler to experiment different hair style. I use all different kinds of volume shampoos. I use Pantene and Carol's Daughter products. I use Suave Coconut Shampoo and Conditioner. I use Pantene shampoo and conditioner. I use a clarifying shampoo every three days and very little hair product. Every couple of months I go get my hair deep conditioned. i use herbal essences right now! Thanks for letting us know about this product. I use Tresemme right now and I can tell my hair is what I call "getting used to it" and I need a change. Right now I am using Loreal Total Repair 5 shampoo. I switch all the time, but right now I'm just using Suave Shampoo and Conditioner! I currently use Herbal Essence shampoo and conditioner for hair care. I use mostly Nexxus products in my hair. I'm using Tresemme right now. Right now I'm using tresemme but I'm looking for something new. I have yet to find a shampoo/ conditioner that I LOVE. i use suave professionals 2-in-1 pump shampoo/conditioner. I use Tressame shampoo and conditioner. I usually use tresseme or suave, depending on how much money we have at the moment. My wife uses Dove hair care products. I use Wen every other day and Morroccan oil the other days! Thanks so much for the chances to win. I use Pantene shampoo and cream rinse now. I use Dove shampoo and conditioner now.